Alumna visits WCL to show new TV series, Scandal, based on her career | American University Washington, D.C.
“You’ll change lives. You’ll slay dragons. … You’ll be a gladiator in a suit,” experienced crisis manager Harrison Wright warns Quinn Perkins before she accepts a job at Olivia Pope and Associates on the new ABC show Scandal. Four days before its prime-time television premiere, Judy Smith, WCL/JD ’86, treated the students at American University’s Washington College of Law to a sneak peek of the first two episodes of Scandal, whose main character, Olivia Pope, is based on Smith. During a Q&A session with Smith, students were also given a peek into Smith’s high-powered career as a Washington problem-solver and crisis manager. Smith is the head of Smith and Company, where she has helped many prominent figures navigate scandals. Her clients have included Monica Lewinsky, former Senator Larry Craig, and quarterback Michael Vick. Before forming her own company, she worked for the special prosecutor on the Iran-Contra affair and the U.S. Attorney’s Office when D.C. mayor Marion Barry was videotaped smoking crack. She also was President George H.W. Bush’s deputy press secretary. She also credits WCL for prepping her to face the White House press corps, since it is much like being in court and facing a judge’s questions. Some of the stories Smith told WCL students seemed to belong on TV instead of in real life. “Crisis is not a nine-to-five job. … Crisis happens when you least expect it,” Smith said. To illustrate her point, she recalled a time when she was taking her son to play in a basketball championship game and she received a phone call. A client – the president of a country – called to tell her his nation was about to undergo an attempted coup. Smith’s son, understandably frustrated by the interruption, complained from the backseat, “You promised! Tell him not to have a coup today!” The nation’s president overheard him and asked to speak with her son. He told him, “I don’t want to have a coup either,” and that he was sorry. With characteristic grace and balance, Smith cheered her son while he was on the court and fielded phone calls dealing with the crisis while he was on the bench. Now, in her recently-released book, Good Self Bad Self: Transforming Your Worst Qualities into Your Biggest Assets, Smith translates her expertise gained from years of high-profile crisis management to teach non-celebrities how to recover from a public or private crisis. She outlines what personality pitfalls lead to mistakes and how to avoid them. 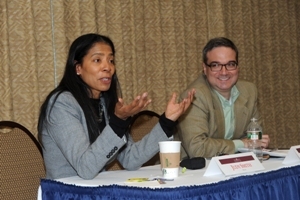 With her obvious poise and knowledge, many of us could learn a thing or two from Judy Smith.